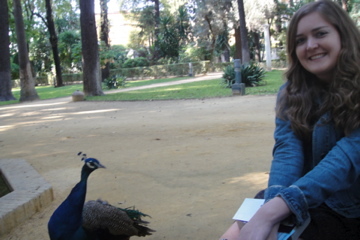 Writing postcards in the park near our apartment…the domesticated peacocks get a little too close for comfort! The risks that writers take! Awww thanks Grandpa! Yeah, peacocks have sharper-looking beaks than I would have thought! But they sure are nice to look at. And there are baby peacocks in the park too-so cute! Jenna, I’m currently getting email updates when y’all post. Such a joy to hear about your fun adventures!